In the space of half a decade, the US has been transformed from a large prospective importer of gas to an even larger prospective exporter. In a scramble to evolve with the market, US terminal developers such as Cheniere and Freeport are looking to convert their recently built regas terminals into liquefaction facilities. In order to finance this conversion they are aggressively marketing flexible LNG supply contracts to European buyers. While US LNG offers an interesting supply diversification option for a European buyer, the value and exposure of these supply contracts need to be considered in a portfolio context. The US has 12 regasification terminals (a combined 196 bcma of import capacity) that currently stand largely idle. These terminals are testament to the pace of the unconventional gas revolution that has turned the US gas supply/demand balance on its head. In the space of half a decade, the US has been transformed from a large prospective importer of gas to an even larger prospective exporter. In a scramble to evolve with the market, US terminal developers such as Cheniere and Freeport are looking to convert their recently built regas terminals into liquefaction facilities. In order to finance this conversion they are aggressively marketing flexible LNG supply contracts to European buyers. While US LNG offers an interesting supply diversification option for a European buyer, the value and exposure of these supply contracts need to be considered in a portfolio context. The key element of the contract structures that are being offered to underwrite the US LNG export projects is flexibility. These contracts offer the right but not the obligation to purchase LNG. The contract buyer pays a fixed capacity fee (to cover fixed & capital costs) for the option to purchase gas at an agreed premium to Henry Hub prices (~115%) and liquefy it for export. The premium covers variable costs (e.g. transportation and processing). The contract structure can be deconstructed into an option on the spread between the Henry Hub price and prices in destination markets. The strike price on this option is the premium to Henry Hub (e.g. 115%) plus variable shipping and regasification costs. The intrinsic value of the contract is driven by the spread between inter-regional hub prices. While there is currently significant intrinsic value against the current forward NBP/TTF vs Henry Hub spread, there is no guarantee that this will remain. Particularly if there is a rise in the production cost structure of new US unconventional gas projects (e.g. towards $5-6/MMBtu). However the LNG supply contract also has significant flexibility (or extrinsic) value given that it provides the owner with the ability to respond to changes in inter-regional price spreads. Importantly from an exposure management perspective, Henry Hub pricing is attractive as it allows clean forward hedging against a transparent price curve which is liquid a number of years ahead of delivery. Henry Hub exposure in a European gas portfolio? It makes sense to address these one at a time as the motivations are different. A European gas supplier servicing customer load (whether it be industrial, residential or power plant) is exposed to European gas hub prices. As a result the first preference for contracting gas supply is indexation to European hub prices. While hub indexed contracts are becoming more common in Europe, particularly for short to medium term contracts or incremental volumes, it is still difficult to secure large long term supply volumes except on an oil-indexed basis. If a European supplier is constrained in their ability to buy hub indexed gas, US exports offer an interesting alternative and one that can be cleanly hedged in the forward market. The recent losses suffered by European suppliers (e.g. E.ON, RWE, GDF) illustrate the dangers of sourcing gas on an oil-indexed basis when selling to customers on a hub price basis. Buying gas at Henry Hub to service European load also entails significant risk. But the development of US LNG export projects is likely to mean an increase in the influence of Henry Hub on European hub price dynamics. If a European gas portfolio manager believes that this transatlantic price correlation will increase, this may underpin a case for introducing Henry Hub indexation exposure into the portfolio to reflect the Henry Hub element of the ‘basket of exposures’ that influence European hub prices. This may be more attractive than contracting new supply on an oil-indexed basis. The business case for purchasing US LNG supply as part of a broader LNG portfolio strategy is clearer. But if a US export contract is purchased to add supply flexibility to an LNG portfolio then the contract value dynamics become more complex. This is because the surrounding portfolio dynamics will be important in determining how the value of access to liquefaction capacity can be monetised. The business case to purchase an export contract focuses on extracting a return from contract flexibility over and above the capacity (or option) fee paid to the terminal operator. To the extent that US export capacity remains constrained, there may be intrinsic value that can be extracted by shipping gas from the US to Europe. But as US export capacity increases, intrinsic value will diminish and export contract value will increasingly focus on the flexibility to respond to volatility in inter-regional price spreads. For example the US supply contract may enable European portfolio load to be serviced by swapping Henry Hub sourced cargoes for LNG from a dedicated Middle Eastern supply source, freeing up cargoes to be sold into Asia in response to a price premium. The ability to monetise the flexibility value of the supply contract will depend on how it interacts with other asset exposures in the portfolio. US LNG exports will commence in earnest in 2015-16 when BG, GAIL, Kogas and Gas Natural Fenosa receive their first volumes from Cheniere’s liquefaction terminal at Sabine Pass in Louisiana. At this point there is likely to be a clear first mover advantage given US export capacity will be heavily constrained. But it is unclear how long this advantage will last. There is currently uncertainty as to the extent the US government will grant export approvals. However there is a total of 128bcma of export projects currently under review by FERC, with an additional 80 bcma of projects under development. This suggests that there is the potential for US export capacity to reach 20-30% of current gas demand. If anything like this volume of liquefaction capacity is built, then the transatlantic price spread will likely be capped around the variable transport and processing cost differential. In other words export capacity is likely to be unconstrained except in cases of shorter term market stress (e.g. extreme weather, supply disruptions). Buying a long term export contract because US gas is ‘cheap’ is a questionable business strategy. What is more important for a buyer is an understanding of the portfolio impact of flexible Henry Hub indexed exposure. This means looking past the intrinsic value of moving gas across the Atlantic and focusing on how US export flexibility can be used to create value and manage risk in the context of the surrounding asset portfolio. 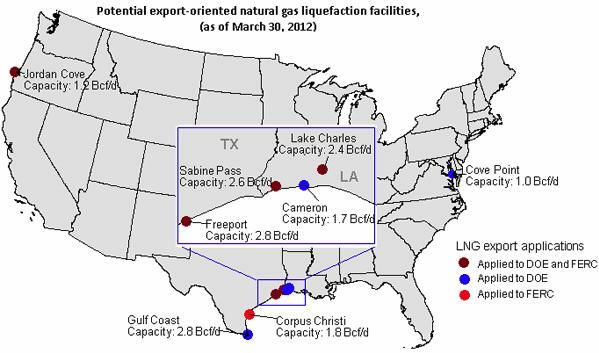 Will US LNG exports revolutionise the global gas market?